Is it Wrong To Dress Up Your Dog? 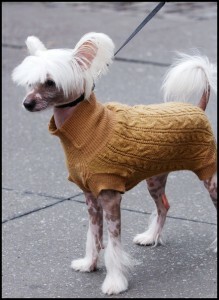 In LA dog fashion is all the rage and dog owners will keep up with the trends to keep their dog looking hot on the streets. However, is this going a step too far? Consider the following scenario, it is one of the hottest days of the year and you see a lady with her poodle, which has a thick woolly coat, dressed up walking beside her, panting vigorously. It can be harmless fun, if the dog doesn’t get stressed or object to be dressed up. However, there needs to be some sensibility added in too, so that a dog is not made to suffer in the process. It is certainly all the trend at the moment for dog owners to make a fashion statement with their pets and this is happening in countries all over the world. It is not surprising when celebrities are splashed all over the magazines with their toy dogs all dressed up. That coupled with the change of traditional roles for women in society and more and more of them choosing to wait until their late 30’s to start having children, so have a dog that is their ‘fur’ baby. With more of us wanting the best for our dogs and considering them part of the family, it is not surprising that pet pampering is high on the list of priorities. To many it is just harmless fun and if a dog dislikes wearing clothes and accessories they will let you know. There are practical and caring reasons for clothing our dogs as well, for example, some dogs really dislike wet weather. In this case it is beneficial to the dog if you have a look at dog rain coats. it can be distressing to see your dog is desperate to do their business but refuse to step out in the rain and a simple solution like a waterproof jacket can make all the difference. Different breeds of dog have different coat types. Dogs with a thin short coat, like a Chihuahua, greyhound, boxer or even the hairless Chinese Crested will feel the cold in the winter and most would be thankful of a coat to keep them warm, like these by Ruffwear dog gear UK. Whereas some dogs have a double coat, which consists of a thick, insulating undercoat, coupled with a top coat. The top coat helps to keep them cooler in summer and traps the heat in winter. These breeds of dog, for example, Border Collie and German Shepherd, do not need to wear a coat and will likely feel uncomfortable and hot if forced to wear one, even on colder days. Some people believe that dogs have no say in being dressed up and can’t do anything about it. This is true to some extent, although dogs will find ways to let their owner know if they not comfortable it. The problem lies in the owner as to whether they listen to the signs their dog is giving and whether or not they have an understanding of basic canine behaviour. 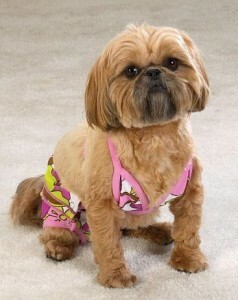 Knowing your dog well enough, you will be able to tell if your dog is enjoying and accepting of wearing clothes. © 2019 Punk Rock Dogg.